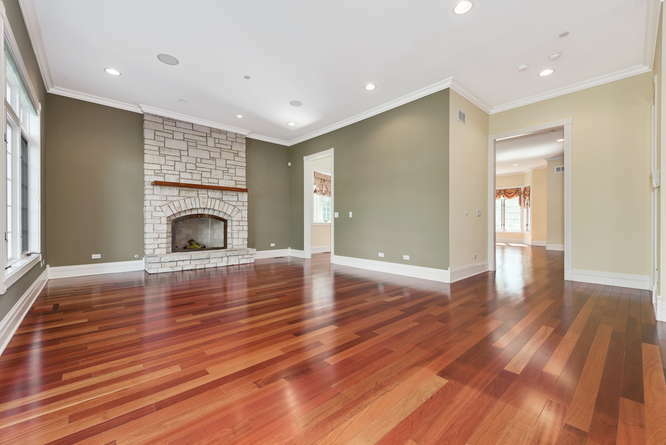 Magnificent custom stone and brick 6 bedroom, 6.5 bathroom Colonial home in Park Ridge. 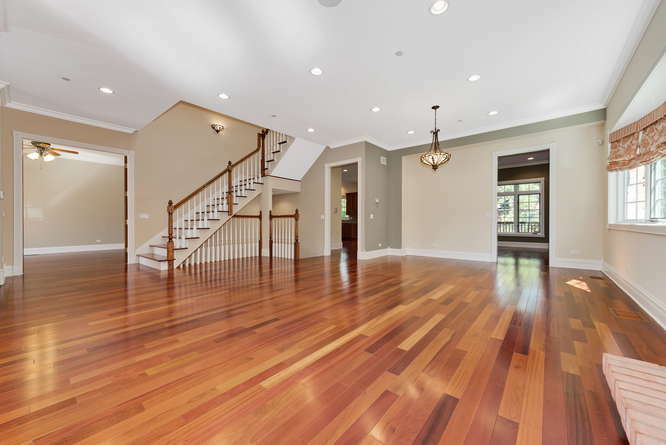 No details have been missed in this exquisite home that boasts Brazilian cherry hardwood floors, 10 foot ceilings, exquisite mill work, 8″ trim, crown molding, 8 foot custom doors and custom blinds throughout. This spectacular home includes a first floor bedroom/office, 6 skylights, 3 fireplaces, walk-in closets, 2nd floor laundry room and a bonus room for storage or play area above the 2 car garage. 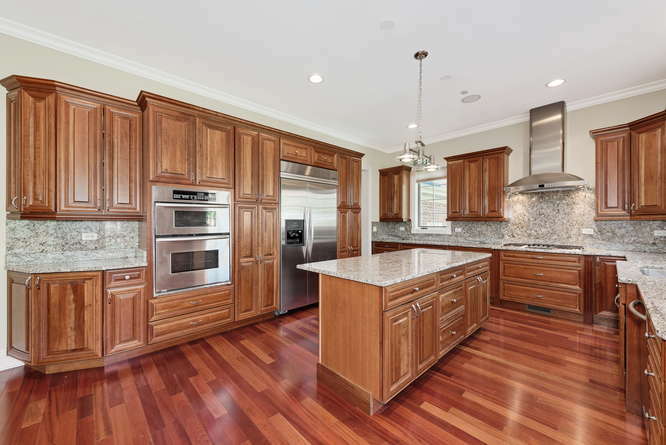 Gourmet kitchen features 42″ cabinets, a large island, granite countertops and high end stainless steel appliances, along with a Thermador cook-top. 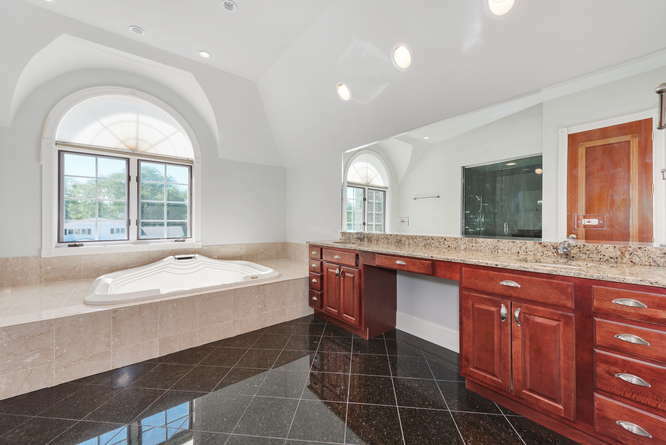 Each bedroom has its own bathroom finished in natural stone, marble, and granite with Grohe and Toto fixtures. 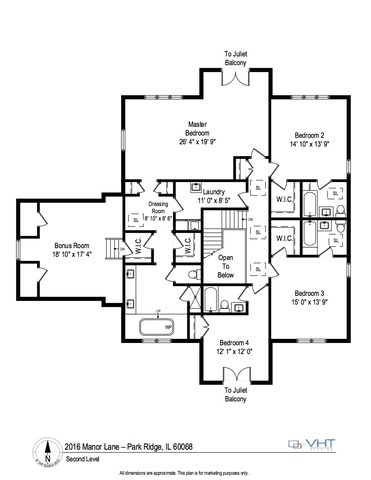 Master Suite provides a luxurious Jacuzzi bath with a fountain feature and a walk-in shower with dual shower heads and steamer. 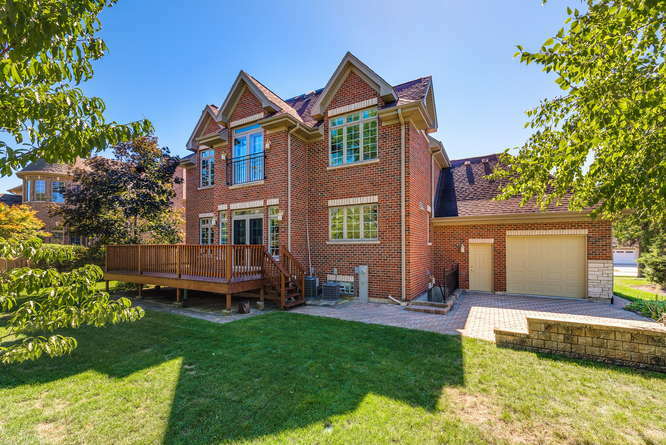 Full finished basement with bedroom and full bathroom, wet bar, additional storage and radiant heated floors. Security and sprinkler systems, built-in speakers and intercom, professionally landscaped with lighted walkway and yard. 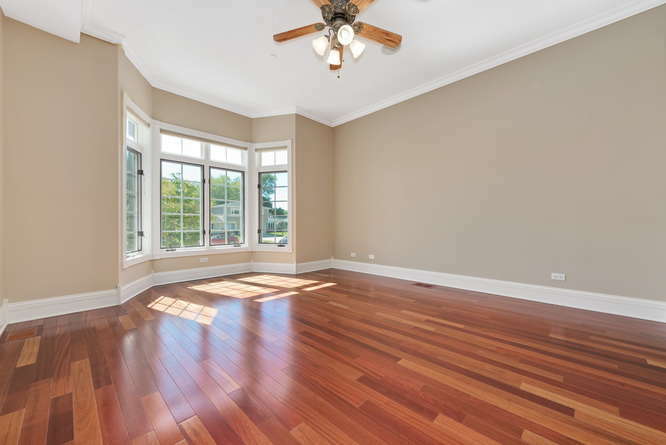 Close to schools, shopping, Metra, and hospital. Custom 42 inch cherry wood cabinets with decorative hardware, high-end SS appliances, granite counter tops and back splash, Thermador cook top and GE Monogram hood. 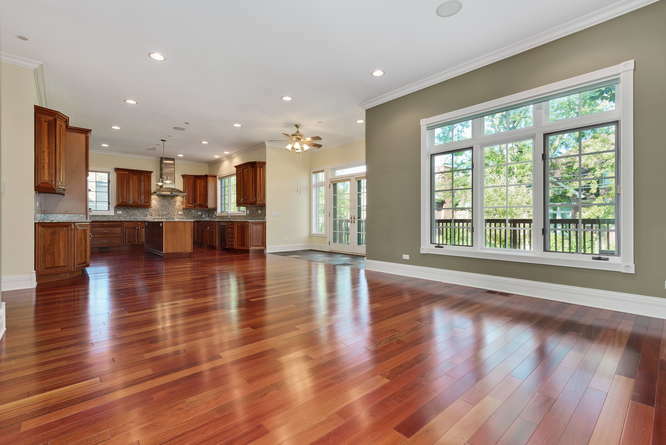 Eating area sits between the kitchen and family room with sliding glass door leading to (25 x 9) wooden deck, stone and hardwood floor, recessed lights and fan/light fixture. 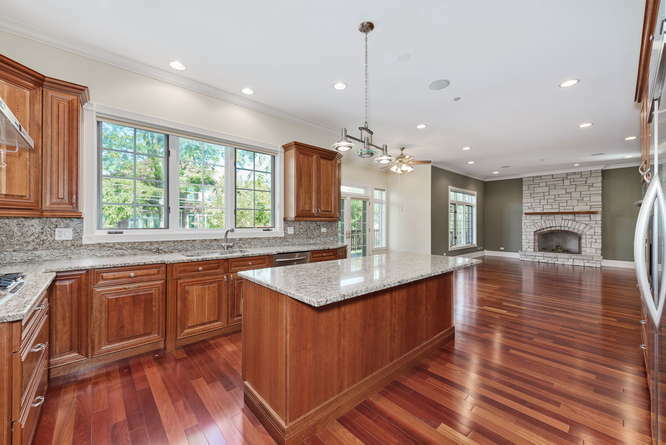 Open to the kitchen and eating area, the family room has a stone gas fireplace with Brazilian cherry wood mantel, large window, built-in speakers, crown molding and trim, and recessed lights. 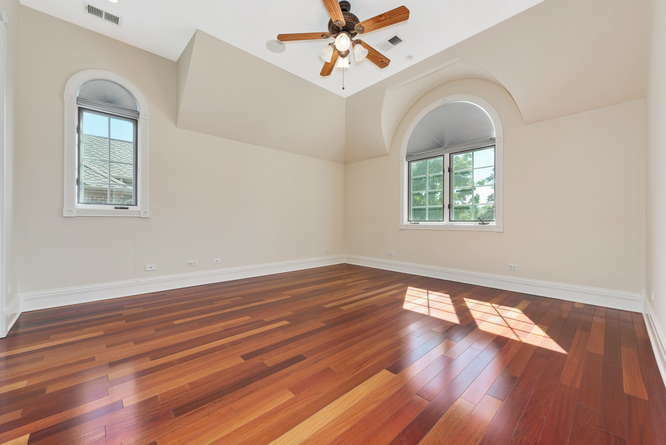 Spacious dining room with 10’ ft. ceiling, bay window, Brazilian cherry wood floors, chandelier, crown molding, and custom trim along floor, windows, and doorway. 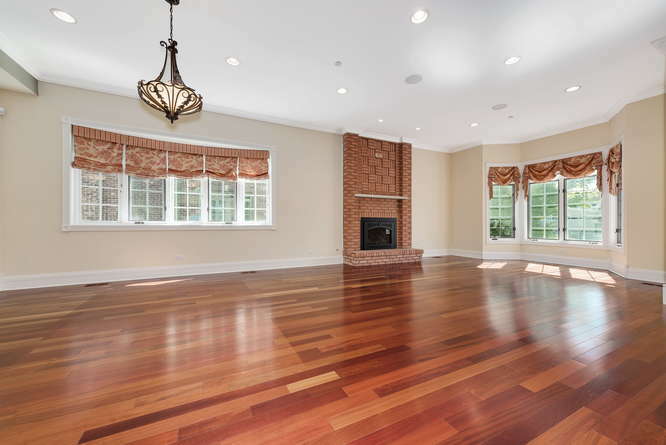 Combined with the dining room, the living room has a beautiful brick gas fireplace, bay window and recessed lights for brightness, and built-in speakers. 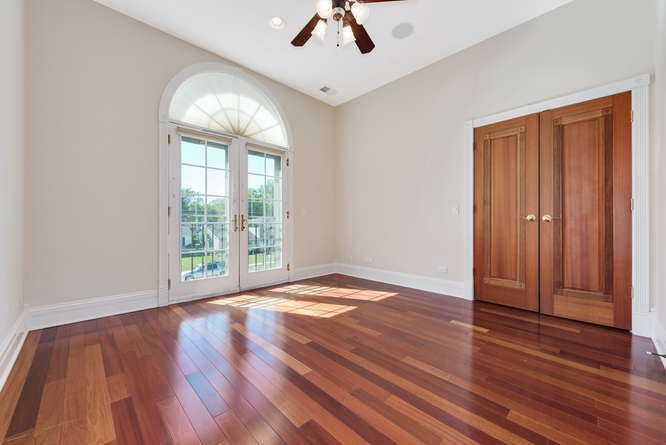 Magnificent custom French doors, bay window, custom closet door and hardware, fan/light fixture, crown molding and 8 inch trim. 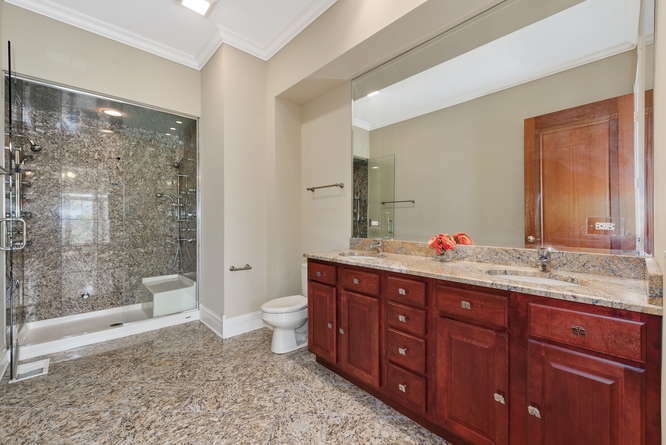 Impressive bathroom off the 5th bedroom/office, heated ceramic tile floors, dual shower heads, steam shower, cherry hardwood cabinets with custom hardware, crown molding and 8 inch trim. 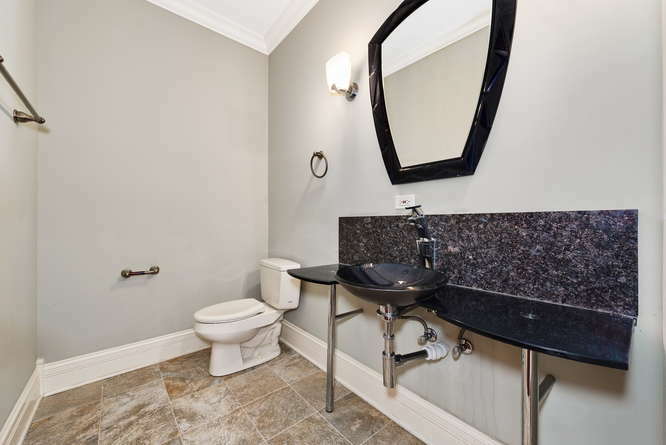 Located off the kitchen, the powder room is finished with tile floor and modern vanity. 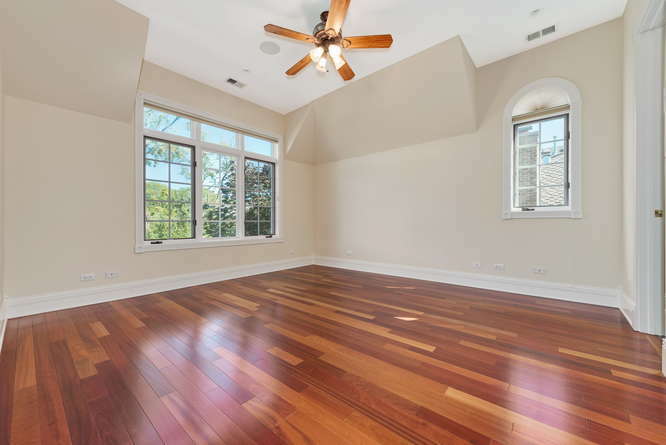 Bright and roomy with Brazilian cherry wood floors, a Juliet balcony, recessed lights, ceiling fan/light fixture, built-in speakers and a Bonus Room (18 x 19) over the garage for extra storage. 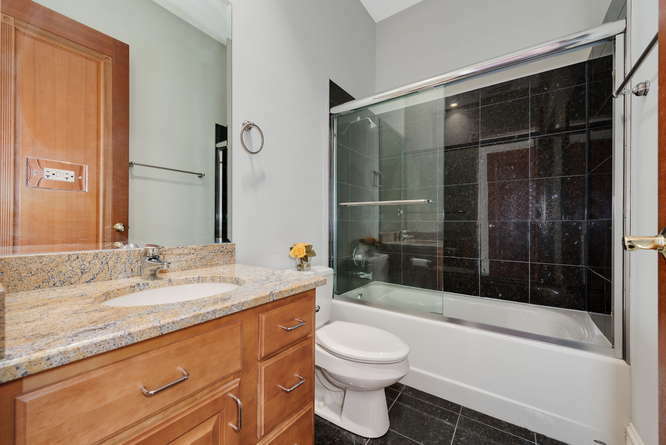 Ceramic tile floor, Jacuzzi tub with jets and fountain feature, large walk-in shower, double sinks with granite counter tops and cherry wood cabinets with custom hardware. 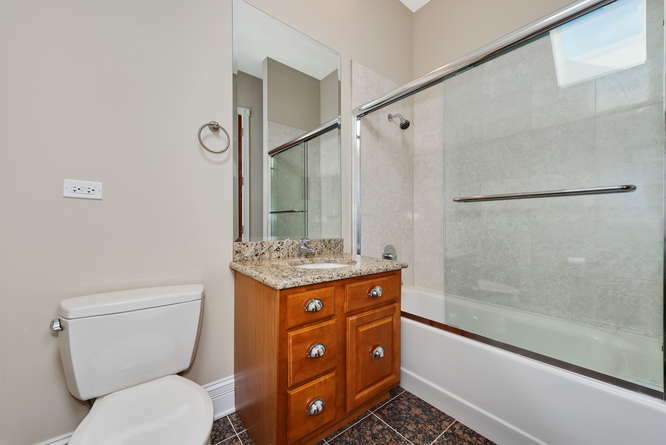 Walk-in shower with dual shower heads and steamer – a perfect place to relax. Brazilian cherry wood floors, custom blinds, large window, trim around window, closet, and floor, walk-in closet, built-in speakers, ceiling fan/light fixture. 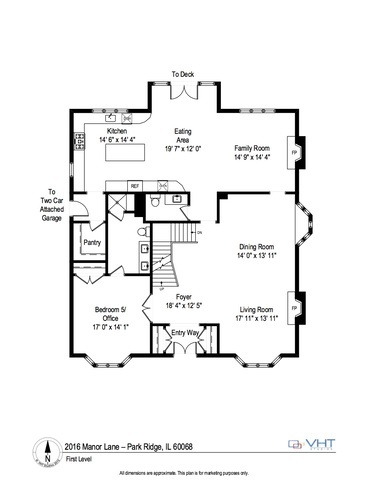 Private bathroom for bedroom 2, skylight, ceramic tile floor, shower/tub, vanity with granite counter top, recessed lights. 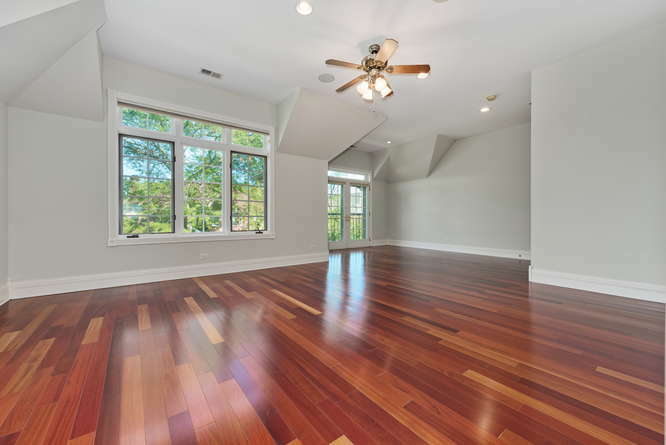 Brazilian cherry wood floors, custom blinds, trim around window, closet, and floor, walk-in closet, built-in speakers, ceiling fan/light fixture. 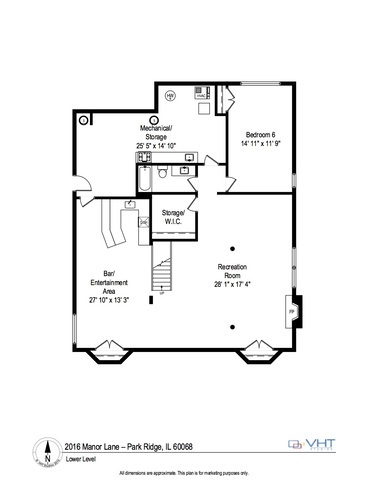 Private bathroom for bedroom 3, ceramic tile floor, cherry wood vanity with granite counter top, shower/tub, skylight. 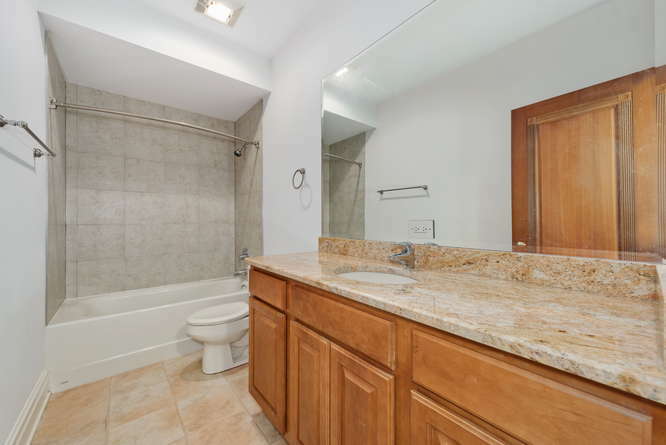 Private bathroom for bedroom 4, ceramic tile floor, cherry wood vanity with granite counter top, shower/tub. 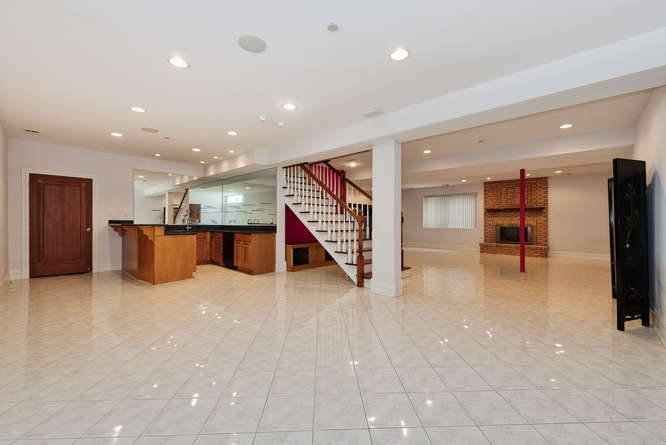 This sizable basement area is ideal for entertaining friends and family with a wet bar, built-in refrigerator, tons of recessed lights, a brick gas fireplace, and lots of storage closets. 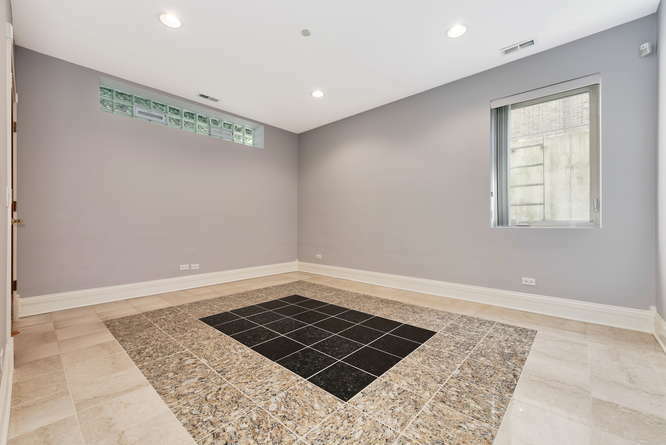 Custom, ceramic tile floor with accent tile design, egress and closet, glass block window, recessed lights and trim around floor and closet. 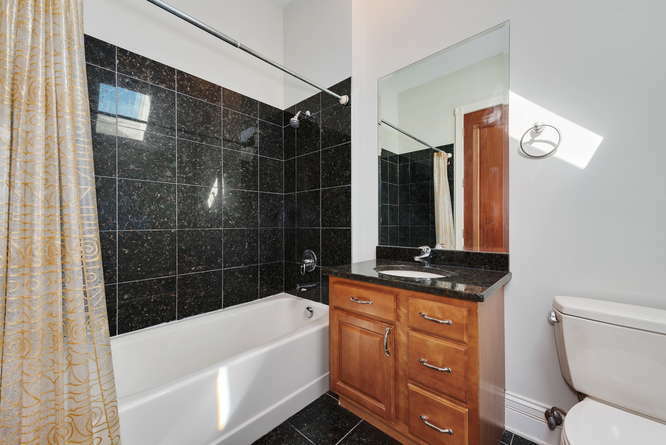 Adjacent to the basement bedroom, this bathroom has ceramic tile, cherry hardwood cabinets, granite counter top, shower/tub, and recessed lighting. Plenty of space on this wooden deck that extends the entertaining area to the outside so dining al fresco is enjoyable and easy. 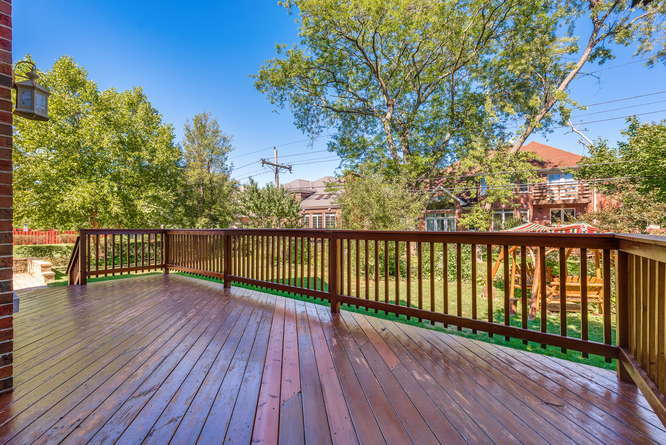 Professionally manicured yard with wooden deck and brick patio that also serves as a parking spot, if needed.